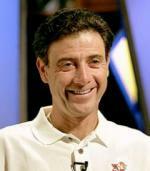 Roger helped Tyson Foods promote their products by producing a weekly fantasy football blog for Tyson. At the end of the NFL season, Roger attended a corporate meet and greet with Tyson employees. He signed footballs, shared Super Bowl stories and bowled with the guests. 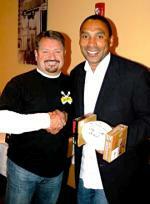 Direct Sportslink designed Roger Craig's Official Website for Roger Craig agent information, Roger Craig motivational speaker information and other appearances. You can secure Roger for any appearance here with Direct Sportslink or through his website. A Roger Craig personal appearance, Roger Craig speaking engagement, or Roger Craig endorsement will reflect well on your company. To hire Roger Craig now for any corporate appearance, fundraiser, motivational speaker event, personal appearance, autograph signing, or website endorsement please contact our celebrity agents at 1-877-6-SPORTS. We will contact Roger Craig or contact Roger Craig's agent and provide you with the booking fees and availability immediately upon your request. Direct Sportslink is the only sports speakers bureau and talent booking agency based in the United States securing only sports talent for corporations, associations, and organizations for motivational speaking engagements, personal appearances, and endorsements. We are the premier sports celebrity booking agency and a sports celebrity procurement expert. Accordingly, we will provide you with any relevant Roger Craig website information and booking agent details so that you can hire Roger Craig for your next event. Craig joined the NFL's San Francisco 49ers as a second-round draft choice in 1983 out of the University of Nebraska and was a vital member of the San Francisco offense during three Super Bowl championship seasons. The 6-foot, 219-pound running back set an NFL record for a running back with 92 pass receptions in 1985, gaining 1,016 yards. He also became the first player in history to gain more than 1,000 yards receiving and more than 1,000 yards rushing in a single season. Craig was named the National Football Conference's offensive player of the year by United Press International in 1988, when he rushed for 1,502 yards and caught 76 passes for 534 yards. He scored 3 touchdowns, 2 on pass receptions, when San Francisco beat the Miami Dolphins 38-16 in Super Bowl XIX after the 1984 season. In two other championship seasons, 1988 and 1989, Craig averaged 133 yards a game in total offense during the playoffs. An All-NFL choice in 1988, he played in four Pro Bowls. 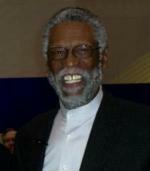 The Los Angeles Raiders signed him as a free agent after the 1990 season, when Craig was slowed by injuries. After one year as a backup in Los Angeles, he went to the Minnesota Vikings in 1992. He retired after two seasons in Minnesota. Craig is an avid runner and has participated in numerous marathons. He was the 2010 Grand Marshal for the Toyota/Save Mart 350 at Infineon Raceway. 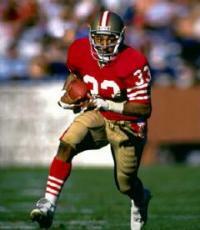 Official Roger Craig Website. Based on your interest in Roger Craig as a speaker or for a personal appearance, Direct Sportslink has provided you additional links below for other sports talent with similar appearance fees, speaker topics, and categories that match Roger Craig.